As the name implies, waterproof cable gland can be applied to the environment with water, providing safe and reliable connection, the most important of which is to achieve waterproof effect. So how to choose the type of waterproof cable gland? What should we pay attention to in the process of installation and use? The main body, lock nut and sealing nut of the plastic waterproof cable gland are made of nylon PA66 material. The nylon pipe fittings are green, environmentally friendly, non-toxic to human body, non-secondary pollution and suitable for long-term contact with water, non-corrosive, non-toxic and non-rusting. The static working temperature is suitable for -40℃∼100℃ and the instantaneous heat resistance can reach 120℃ while the dynamic working temperature is -20℃∼80℃ and the instantaneous heat resistance can reach 100℃. Special claw and rubber parts design, clamping cable wide range, strong tensile strength, waterproof, dust-proof, salt-proof, acid and alkali resistance, alcohol, grease and general lubricant. The metal waterproof cable gland is brass nickel plated, the claw is made of nylon material, and the seal uses soft NBR to tighten the cable, so that the cable does not leave marks after removing the gland; it has good high temperature, corrosion resistance and high pressure resistance, and the salt spray test is no less than 200 hours. Generally, one end of the thread is fixed on the shell, and the nut is tightened and fixed in the shell (or according to the selection of threads connected to the electrical equipment with internal threads at the inlet and outlet). The cable is directly drawn out by the waterproof gland, and the nut is tightened properly, so that the cable can be protected. It is widely used in fixing and protecting wires and cables of mechanical equipment, electrical equipment, marine electrical and anti-corrosion equipment. Tightening and sealing of cables. 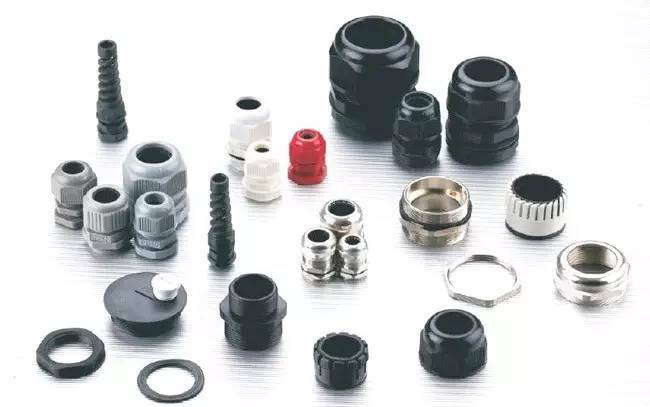 Tightening refers to locking the cable through waterproof gland, so that the cable does not produce axial displacement and radial rotation, to ensure the normal connection of the cable. Sealing means isolating water and dust from entering. 1. Determine the IP protection level of cable glands according to the service environment and requirements of cable glands. 2. Determine the material and color of cable glands according to the use environment and requirements of cable glands. 4. Choose the clamping range of about + 10% as the specific type, which is close to the cable outer diameter. 5. In general, it is suggested that O-ring should be used to meet the technical standard of IP67. 7. If it is used in the case of explosion or flammable gas, explosion-proof glands are needed. 8. If there is EMC requirement, EMC shielded connector should be selected. 1. Waterproof Cable glands with different materials are used in different environments. 2. It is recommended to use torque wrench to tighten (recommended). 3. When more than IP65 is required, O-ring must be used. 4. In order to ensure that the gland can withstand certain pressure, it is suggested to add a protective sleeve to strengthen insulation and protection. 5. In order to ensure waterproofing and longer operation, it is suggested that double-wall glued thermal shrinkable sleeve and insulating sleeve be used for reinforcement. 6. During construction, staggered docking is the best way to connect the glands (i.e., the cable does not need to be truncated neatly). 7. The self-adhesive tape (or heat-shrinkable waterproof tape) used are all high-voltage products to ensure insulation safety.